Mysafenewpages.com is a search engine that has nothing to do with the legitimate search engine Yahoo.com. In fact, this search engine belongs to a browser hijacker infection, which explains why this search provider appears on browsers, including Internet Explorer, Google Chrome, and Mozilla Firefox without permission. If this has already happened to you, you should remove Mysafenewpages.com from all your browsers as soon as possible because this search engine is known to be completely untrustworthy. In addition, it has been observed that it might even cause harm to the system by leading users to websites containing malicious software. If you do not want to allow malware to enter your system, you need to uninstall Mysafenewpages.com right now. We are going to help you to do that because we know that not all the users are aware of how to get rid of a browser hijacker. We are sure that Mysafenewpages.com will set itself on all the browsers without permission. If you have already noticed it there, you need to eliminate this search engine ASAP. If you do not do anything about its presence and use it to search for the information, you might quickly end up on a corrupted website full of malware. You will not even know that the website contains malware, which means that you might infect your system very quickly. Actually, you should remove Mysafenewpages.com not only because it might provide you with untrustworthy search results and thus expose to potential threats. According to malware experts, it is not worth keeping Mysafenewpages.com because it is going to act behind your back every day too. In other words, there is no need to use it. According to researchers, this search engine might also collect details about users and their activities on the web. This information might even be sold to third parties, and nobody knows where they are going to use it. If you do not like that, delete Mysafenewpages.com and make it stop acting like that. 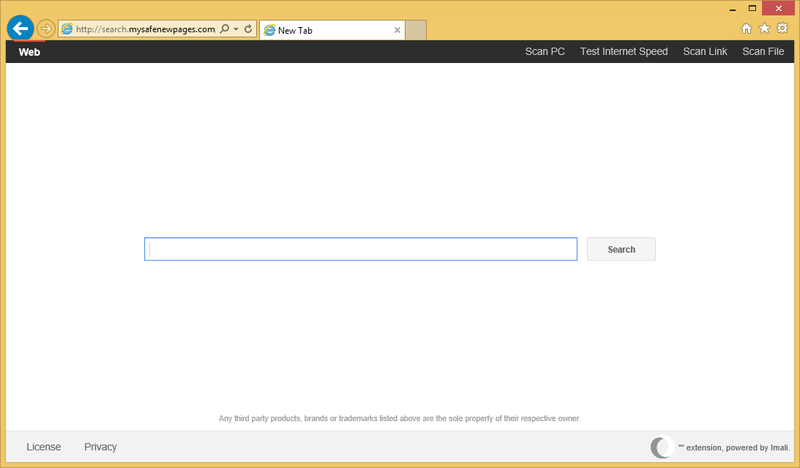 How is Mysafenewpages.com browser hijacker spread? Mysafenewpages.com is a typical browser hijacker, so specialists are sure that it usually travels bundled with other applications. These applications are various free programs like PDF converters, video streamers, and other similar software. Unfortunately, not only browser hijackers travel in software bundles, so it would be very clever that you install a security tool on your computer after you implement the Mysafenewpages.com removal. Only trustworthy tools are reliable and can help you to protect your computer. Therefore, you should install a tool which you know is really 100% trustworthy. How can I delete Mysafenewpages.com browser hijacker from my PC? Mysafenewpages.com might seem quite harmless at first sight; however, the truth is that this search engine might cause harm really quickly. Luckily, it is not that hard to implement the Mysafenewpages.com removal. The easiest way to erase it would be to acquire an antimalware scanner and then perform the system scan. Make sure you do not use a tool you have downloaded from a questionable third-party website.